We offer bushcraft courses for all levels of experience. Our weekend bushcraft courses are the perfect place to perfect your skills, we also offer the chance to take your IOL accredited Foundation in Bushcraft Skills and Wilderness Living Course – Level 2. We also provide bushcraft courses for schools. Our bushcraft courses for schools are specially designed to help children get a basic understanding of bushcraft, experience nature and the natural world in a safe, fun and educational way. Here at Wildway Bushcraft, we believe that there is no better place than the great outdoors. 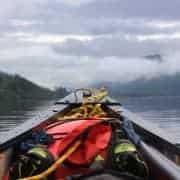 Our goal is to provide fun, practical and educational bushcraft, survival and wilderness living skills to enable you to enjoy the outdoors even more. 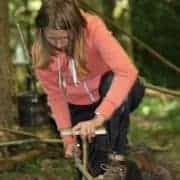 We can tailor your bushcraft courses and survival training to your needs, in our own fun, interesting and unique way. 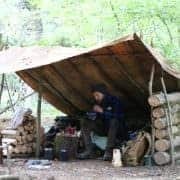 Our bushcraft courses, survival courses, and wilderness living courses are held in some fantastic woodland throughout Dorset and Hampshire. We offer one-day bushcraft courses and weekend bushcraft courses in Dorset and Hampshire. Our one-day bushcraft courses are a great way to focus, one to one, on a variety of bushcraft subjects; be it friction fire lighting, foraging, campfire cooking, shelter building, and more. 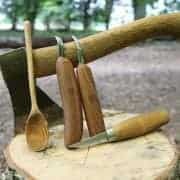 Why not try our weekend beginner bushcraft and survival course and our family bonding bushcraft courses. All of our bushcraft and survival courses are held in a relaxed and friendly atmosphere. 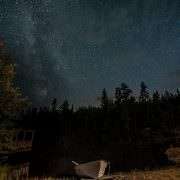 Contact us on john@wildwaybushcraft.co.uk to learn more or click here. Our specially designed bushcraft courses for schools can be tailored to the needs of your pupils. Our Instructors are a friendly bunch and believe learning in this type of environment is the best way to teach bushcraft, survival and wilderness living skills. As you would expect all of our instructors have a vast amount of bushcraft and outdoors skills under their belt and have been teaching and leading groups in the outdoors for years so you will be in great hands. 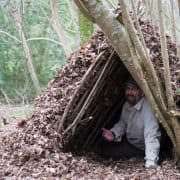 Bushcraft courses in Dorset are great, so why not take a look at our courses and join us in the woods. Spending time in wild places is great for your mental health, it allows you to live in the “now” and take a well-earned break from modern life. Bushcraft allows you to reconnect with family, by achieving a shared goal and removing outside everyday pressures. Just being outdoors is great for your health, being outdoors and learning new skills is even better and is so much fun! Good Bushcraft and Survival skills allow you to have many adventures all over the world, seeing things most people miss out on. Don’t be shy, get in touch and say Hi. We’d love to hear what you’d like to do on a Bushcraft course near you. If it’s not already on our extensive course list then we might just add it for you.